This CD was recorded using Sony Direct Stream Digital & Super Bit Mapping technology. Recorded live at the Blue Note, New York, New York from November 24-26, 1998. Includes liner notes by Alyn Shipton. 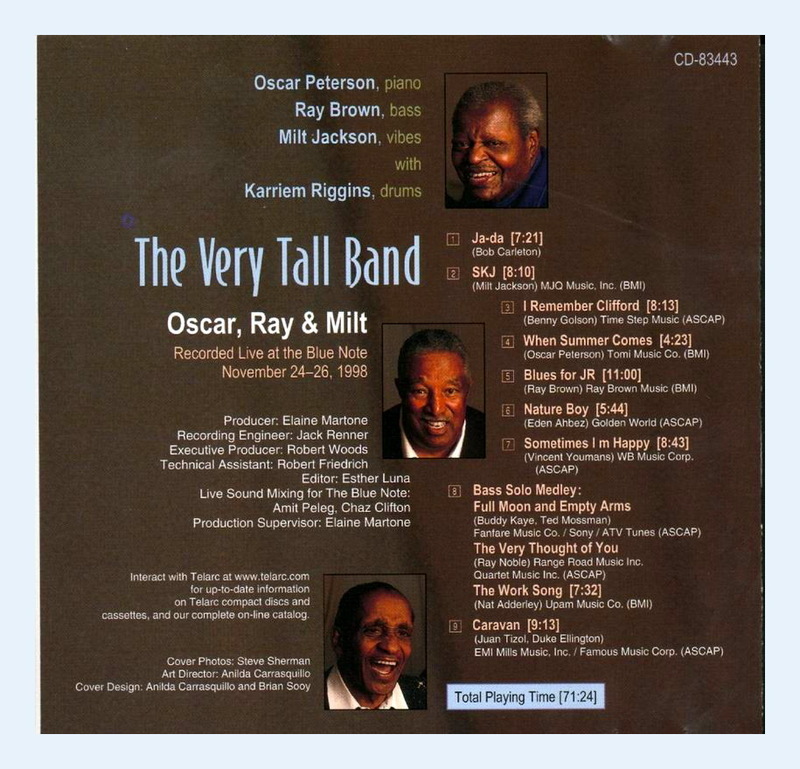 The Very Tall Band: Oscar Peterson (piano); Milt Jackson (vibraphone); Ray Brown (bass); Karriem Riggins (drums). Personnel: Oscar Peterson (piano); Milt Jackson (vibraphone); Karriem Riggins (drums). Liner Note Author: Alyn Shopton. Recording information: Blue Note Jazz Club, New York, NY (11/24/1988-11/26/1988). This is one of the best post-stroke Oscar Peterson sessions in the catalog, thanks in great part to the distinguished company he keeps (Ray Brown and Milt Jackson) and the stimulating atmosphere of the live setting (New York’s Blue Note club). Right from the first track, «Ja-Da,» you can tell that this is going to be a fun session, as the slippery, swinging, totally interlocked, totally assured way in which these vets react to each other kicks in immediately. Peterson’s right hand is fleet, feathery in touch, and bluesy in feel; the left providing just enough punctuation, and at 75, Jackson’s bluesy eloquence had not diminished in the least. Ray Brown’s time and placement of notes is, as usual, impeccable, and the very talented drummer in his group at the time, Karriem Riggins, provides a swinging kick for the quartet. In the spirit of democracy, each star gets a solo number — Peterson plays his ballad «When Summer Comes,» Jackson pours out a doleful «Nature Boy,» and Brown’s stream-of-consciousness medley eventually attracts the funky brushes of Riggins. But it’s always better to hear them together. 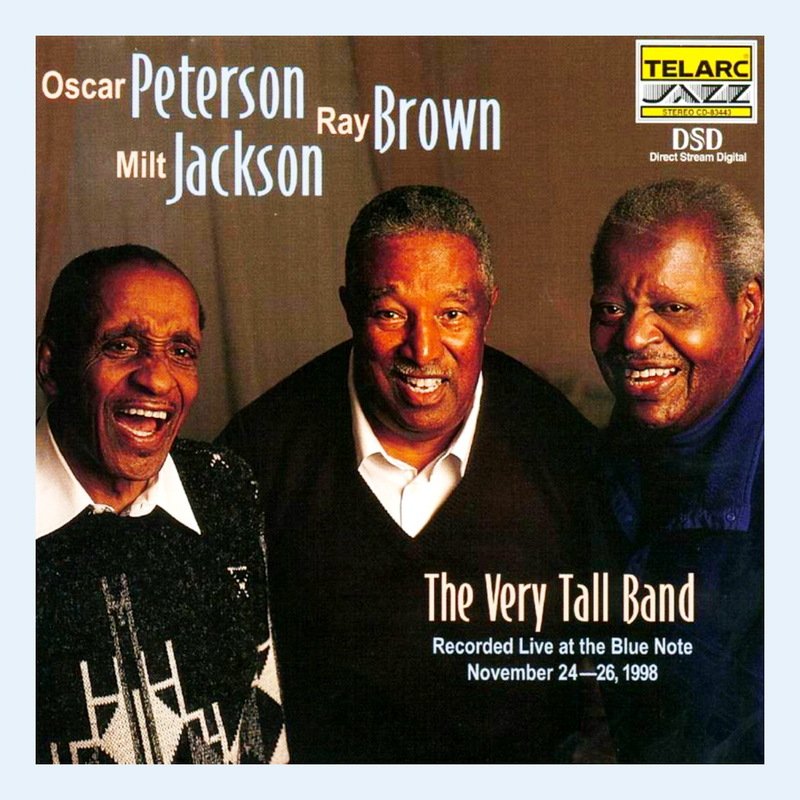 Posted on Μαΐου 10, 2011, in JAZZ, LIVE, MILT JACKSON, OSCAR PETERSON, RAY BROWN. Bookmark the permalink. 3 Σχόλια.